The Georgia Tech Bicycle Campus Master Plan is developed with a focus on creating a safe, healthy and positive campus biking environment. It is also focused on establishing Georgia Tech as a national leader in higher education bicycle planning, design and culture. The goals and recommendations in this plan are developed to position Georgia Tech to reach even higher and achieve Gold or Platinum designation. 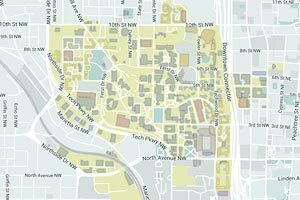 Georgia Tech will define the bicycle-friendly university of the 21st century. As a result, we will be leaders in setting policy, developing programs, and increasing infrastructure to support and safely accommodate bicycling to, from, and on the Atlanta campus. "How does Georgia Tech bike?" will be a common question in research, business, the media, and government.